Safely and easily removes polishes, sealants, waxes, etc. This microfiber towel has it all with the extremely fine and soft fibers. It has a tag less design and bounded edge to minimize fraying and maximize durability. The 16" x 16" Yellow Two Sided Towel helps you remove excess product (polish, sealant, wax, etc) from your exterior paint with ease. One side has longer fibers that help remove loose particles and collect them in the threading. The other side has a tighter weave and shorter nap that helps remove product that is more challenging to remove. This ideal combination of different microfiber naps on one large towel that make it perfect for removing excess product. It can also be used to clean your interior, dust, glass care, leather care, etc. When you first pick up this towel you instantly notice how soft it feels and like all DI Microfiber it lasts! Some towels fade extremely quick after just a few washes and cleanings, where as these towels are going to get you hundreds of uses. 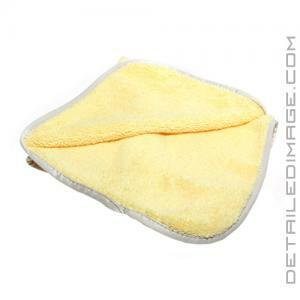 If you are looking for a great all around microfiber towel then look no further then the DI Yellow Two Sided Towel. This is another great product. The towel has two sides, one side for polishing and the other side for removing the polish. Works great, the only con is I didn't buy enough! Got the towels at good price during a promo. I like them. I use them for detail spray. Soft and good quality. I have washed them twice and they hold up well so far. Excellent product, I was hoping for a bit softer cloth, but this still a great product.